Party tents are spacious, stylish, and portable as well as easy to install. Made up of finest quality materials, these tents are available in different sizes, designs and colour combinations. It is ideal for organizing parties and provide flexibility to hold a party at your preferred choice of venue. These tents are used to enhance the comfort of a party and are aesthetically designed to withstand adverse weather conditions. Party tents are spacious, come with superior portability and easily set up. The flawless design and finish standards followed in these tents also make these party tents pleasing in looks as well as match up with the mood of the occasion. Magical Party Tent as the name implies adds a magical touch to your party by its aesthetic designs. 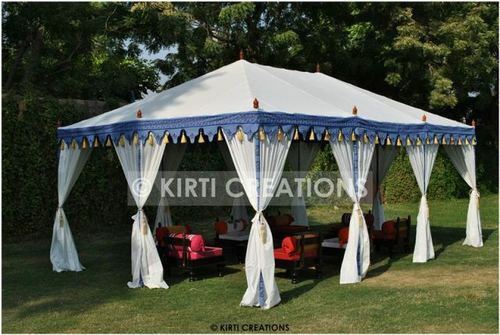 White color tent and blue color cutwork border makes these tents elegant and sophisticated. Magical Party Tents are easy to install and adds charm to your surroundings.